Thanks for the nice review, Dave! But my Integrity actually has very, very few lead breakages, virtually none, which I thought was quite strange when you mentioned all your lead breakages. I was actually looking for this pencil for a while! I had one, but I ended up having to throw it away. It was working fine up until I dropped it on the floor one day. 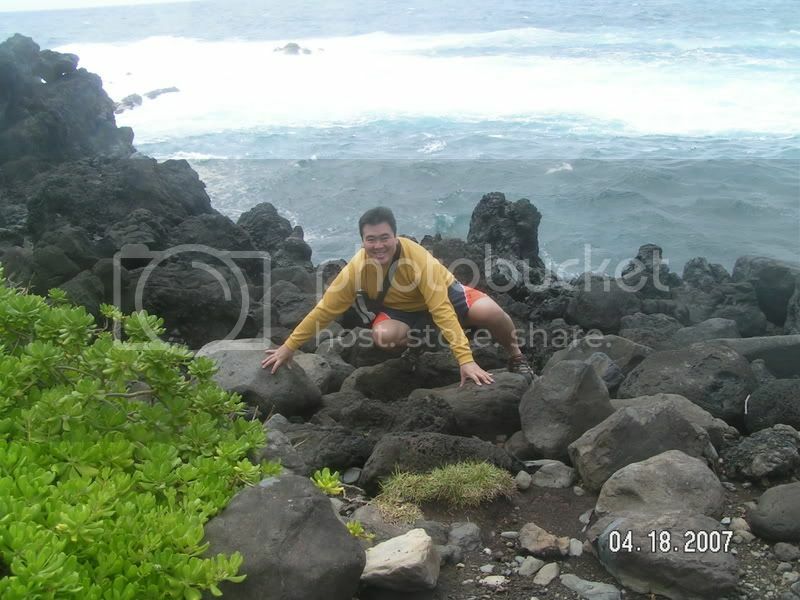 After that, I had near constant lead breakages. The tip's design is very touchy, I guess. A fine review of the pencil model I use daily. (I own four of them.) I have found that the lead delivered with the pencil (maybe Staedtler HB) is very prone to breakage. When I replaced that lead with the Pentel Super Polymer H hardness I usually use, there is essentially no breaking. Based on that experience I blame the original lead and not the pencil. Thanks for your comments about lead breakage. I would self-describe as “heavy-handed” so I guess I maybe more prone to lead breakage than average. I suppose I should make it a rule that whenever I suffer from excessive lead breakage I should change the leads to Pentel Ain and see if this makes any difference. Next time! before settling on the Sanford Technician/ProTouch II. The cons for me were the thicker body, the grip (which I'd replace either way), and the slightly decreased visibility on the lead end because of the double clutch mechanism making it stubbier. A good pencil overall though. 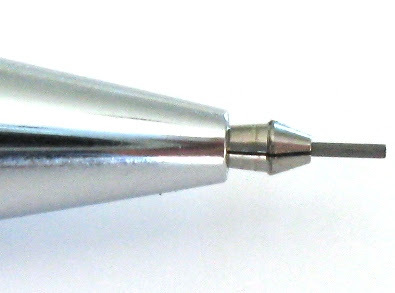 The eraser mechanism is identical to and interchangeable with that of the Sanfords. It's the best MP eraser system I've ever found and VERY reliable. Thanks for the thorough review Dave. I also had very few lead breakages, also I don't see the problem with drafting, but I am no expert on drafting and such so I will stick to what I know. As for the review, I enjoy your prospect on the pencil and agree on most of your points. However, as I said I had very few lead breakages and personally enjoy the eraser mechanism because of the long term use of the eraser and it erases very well. It feels very awkward at first (switching from A zebra m-301)but after a few minutes became a non-factor. Large barrel capacity for refills (could probably fit 30+ leads in there easily) and makes a wonderful general writing instrument. I could definitely see myself buying this product in the future. I've had my Integrity for some time now and have had it replaced by Staedtler once. The only problem other than how cheap it feels is the grip. After about 2 weeks of heavy use it starts to stretch and expand and starts to slide off (why I had it replaced, but it happened to the second one as well). Very interesting concept but I wish they would have improved upon some things. I picked up a couple of these the other week and I have to say I'm disappointed, again. I am experiencing the lead breakage issues that you did Dave. I have not swapped out the lead as another reader had suggested, and quite frankly I shouldn't have to. I agree that Pentel makes superior leads but why sell a pencil with leads that make the pencil such a pain to use?! I have to tell you I have several Staedtler pencils and one of their multis and I have been underwelmed by all of them (including the triplus micro who's pocket clip didn't make it through the week). I'll give them credit for producing one quality eraser, although I personally don't think it's any better than the Pentel Hi-Polymer eraser. I tried their new art gum eraser, and it is junk. It's too soft and greesey and can't compare to the Stanford art gum. But back to the 9505, Dave do you have the packaging? It states on the back of the package that it has a "sliding sleeve for lead protection and longer writing time". More rubbish. Thanks for yuor comments. Yes, I still have the packaging for my 9505. 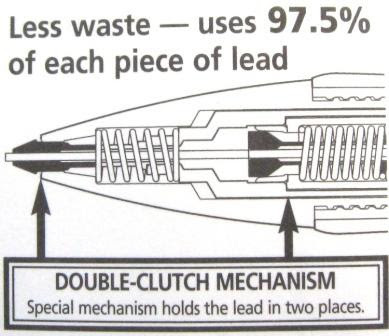 Is your packaging the same as pictured in my first photo, and then later on the diagram of the double-clutch? Mine has no mention of a sliding sleeve, etc. Perhaps yours has somehow ended up in incorrect packaging. All sounds a bit weird. My packaging is different. I got a package of two. I would call the graphics more traditional, or well, boring. The bit about the sliding sleeve is a bullet point on the back of the card. dave, you say you should not have to swap out the lead to make a good pencil. but you are going to have to replace the lead in any MP. lead is realatively inexpensive and a reasonably easy adjustment to make. the pencil is a good foundation, and the lead is specific to the exact aplication. if you ahve a heavy hand, as do i you will break lead in any pencil. i have had to caonciously adjust my writing pessure in general. otherwise i would be mutilating the paper, not to mention burning lead liek crazy. i buy pentel lead in 4 packs of hb and that works fine for me. the twist up eraser has eliminated the need to make sure i have an eraser on hand at all times. i love the 9505, but this conversation makes me want to try out the pro touchII.thanks fir the good review. By far my favorite MP ever. I have been using this model for about 7 years now. I work as an engineer and use it every day, but only for short periods of time or for quick sketching or for notetaking. I have no problem with lead breaking, and I think that the features of this MP (the weight, the twist-up eraser, the double-clutch, the grip, and just the general look of it) make it the perfect pencil for me. The rubber did expand on me on my first Integrity, but I was able to take another grip from another pencil and cut it to the proper length and put it on the body. Since that time, I went online and bought 20 of them in bulk. I've had several people comment after borrowing one of mine, praising the design, feel, and function. I plan on using this model for many years to come - possibly even the rest of my career. Does a .9mm version of this pencil exist? I do a great deal of writing but bear hard on my paper and find I waste much less lead by breakage, and stress my hand less, by using a thicker lead. However, this pencil was gifted to me in the .5mm model for xmas and I like it very much. Any help on this matter would be greatly appreciated - please email me at extraREMOVETHISfiber@gmailANDTHIS.com! I bought 2 of these about a year ago, and I have to say I am quite dissapointed. When I first got it, they broke the lead after just 2-3 advances, and when the lead is held in the bottom clutch only, it wobbles and falls out. Maybe mine's broken. Both of them?? I have been using this for about a year and a few months ago the rubber grip started coming loose! When I write it begins to slide off the pencil, it is very annoying. The glue seems to have worn off. I guess this is the end for me with cheapo pencils ($8 is cheap? ), hopefully I'll have more luck with my next one. It seems the design is very sensitive to production variations; I had a one initially that was very prone to breaking the leads, which is likely due to a slight misalignment between the upper and lower clutch points. What would happens is that it actually stresses the pencil lead and breaks it in the middle. However, I have a second one that I've been using and it has no problems with breakage, even using extremely soft 2B 0.5mm leads. If you get a good one, it works very well. Had I not gotten the second one that was aligned well, I would have given up on this design. However, it's now my favorite. I particularly like the zero-play aspect of this pencil, which is just not possible with other designs without this type of front jaw mechanism. For fine writing, it's unexcelled, because there is no side motion of the lead relative to the body of the pencil when writing. By the way, the back of my package does state "Sliding sleeve for lead protection and longer writing time", but that's clearly a copy and paste error from another item, as it doesn't apply to this pencil. I decided to determine exactly why there's tip breakage with some of these pencils, and I found it to be due to the lower clutch jaws having an irregular channel for the pencil lead. There was either a burr or misalignment on the channel, and what happens is that it breaks the lead right inside the lower clutch when writing, when the jaws are retracted by the pressure of the tip being pushed up. I was able to resolve this using a set of welding tip cleaners, by reaming and smoothing the channel out with the small file. By straightening out the channel, the stress raiser on the lead was removed, and it now works as it should, with no more breakage. There may have been a bad batch of some of these (mine was part of a two pencil set purchased from Staples back in June 2007), but it was easily corrected. I disassembled the pencil to do this, but it might be done without taking it apart. -Unscrew the chrome tip (this may be difficult as it's slippery and hard to hold- it's very tight from the factory) May need rubber coated plier or vise jaws to hold. -Pull the tip straight out, the upper lead funnel is just a press fit on the plastic lead holder tube, and will separate when pulled apart. -There are two locking tabs on the plastic assembly, so a small flat blade jeweler's screwdrive can be used to push in on the tabs, and the upper and lower clutch assemblies separated. 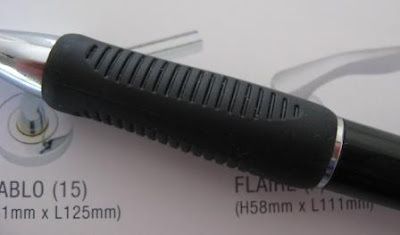 -There's a tiny rubber grommet that provides friction on the lead that is part of the lower clutch assembly; if a pencil lead or 30AWG wire wrap wire is pushed through from the bottom, it can be removed and saved for reinstallation later. -At this point the lower clutch assembly can be worked on with the welding tip cleaner to smooth out the channel. Test it by putting in a pencil lead, setting it to the same exposure as normally used when writing, and try writing with it, rotating it through all the angles to check if it still breaks the lead. When it was bad, I would feel a slight click as I started writing, and when I released the lead, the small lead fragment would fall right out. It was only a few mm long, indicating the breakage was right at the lower clutch assembly. If you're able to apply pressure on the tip without breakage, you can reassemble in reverse order, and it should be functional. Any idea where to buy the erasers for this pencil? I can't find them in any stores.. Looking at another review, it seems that the Faber-Castell TK-Fine Executive and Faber Castell Grip have the same eraser well, thus you could see about them having replacement erasers in store. I found a large blister pack of erasers to fit at my local aaron brothers art store. they are significantly softer and go fast, but erase very well. Ive been using the same 9505 for 6 years or so now. 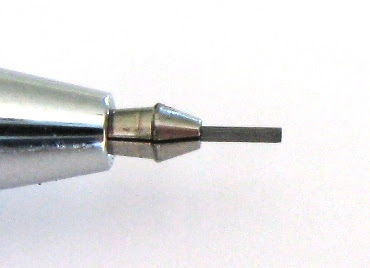 I'm a student so I do my fair share of writing and I do seem to recall breaking some lead when I first started using it, but I no longer have any sort of problem other than cracking the barrel where the tip screws in (wedge of paper fixed it). All of the silver of the writing is long since worn off and the grip is loose and spins freely (but doesn't slide forward) and it keeps going. I believe that the eraser refills are the same as the really thin Papermate refills that fit in the Tech Pro II or Apex. These are available at Utrecht stores. Thanks for the review. Glad to learn I am not alone in my fascinations. 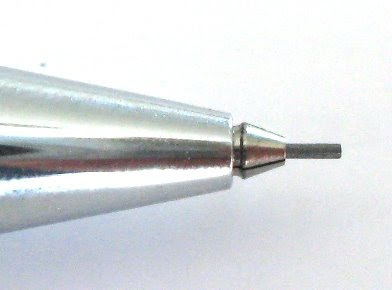 I've used (and mislaid) many a Pentel P205 "programmer pencil" over the decades and just this week retired a 1984-vintage Fisher Futura 0.5 mm. Waste of the lead strand was a big motivator. Another was the unavailability of the eraser or a substitute. I only needed it to plug the lead supply tube and to retain the clearing needle. Fisher actually rummaged in a desk drawer last year and sent one free to replace my petrified original. It too was a dessicated artifact of the ancient past. Needing "just the right instrument" for my electrical engineering coursework, I've acquired a Staedtler 9505 as a stop-gap until my brace of Platinum OLEeNUs arrive. I'd have preferred a tube of lead over the spare eraser packed as a bonus with the 9505, but at $USD 6 for a good tool, I have no real complaint. It feeds reliably down to a millimeter, it handles nicely and promises to serve me well. Time will tell whether problems earlier reported with the chromed tip cone and rubber grip have been resolved. The "jaw" part of the double clutch mechanism holds so well that, despite a lead break, you can continue to use the lead because the jaws are securely gripping the broken piece. Unlike some other cheap mechanical pencils, the lead never pushes back into the pencil when you press down with moderate pressure. I have used mine for 2 full semesters in college and I use the hell out of it. I have only gone through about 10 sticks of lead and I'm still on the first eraser. i just bought one and used it...and havent had any lead breakages...maybe it is just your particular pencil? I found that I had one of these in a pencil cup, didn't know where I'd picked it up, and then today found it in the local university bookstore (undoubtedly the source of the first) and bought a mate. For my general writing purposes, it works well. Haven't experienced breakage, but then I haven't written tons with it (I do alternate with woodcase pencils). Thank you @Mike!! This was my favorite pencil until a very bad lead jam. My chrome tip was actually stuck with thread-lok, it broke free with sock-wrapped vise grips. It truly is an awful pencil. I owned one and it went through lead like a beast because of breakage. A big gimmick. Also the the rubber grip slid off and created left smudgy adhesive on the barrel. A poorly designed and built pencil. Staedtler is all hype, everything I bought has never lived up to expectations, including their Mars plastic erasers. Stick with Pentel. Hey, just jumping in on the Staedtler Integrity 9505 discussion. I love this MP, though it has its faults. BIG REVEAL: I have found cheap replacement lead is the cause of ALL my lead breakage. I only buy genuine Pentel HB lead now. I am also heavy-handed when it comes to writing, but I've owned at least 6 of these and each has performed well. My only complaint is that sometimes a bunch of lead gets stuck in the tube and one lead won't drop down and be clicked out of the tip. I've tried all sorts of things to no avail. I see here Mike has instructions for disassembly, so I'll try that. Otherwise, it's been the best MP I've found...and I use them nearly daily. Ahhh, the perils of cheap lead. Yes indeed, paying a bit more for good Japanese or German lead is well worth it.